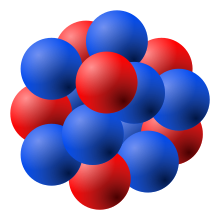 An atomic nucleus is a compact bundle o the twa types o nucleons: Protons (reid) an neutrons (blue). In this pictur, the protons an neutrons leuk lik little baws stuck thegither, but an actual nucleus, as unnerstuid bi modren nuclear pheesics, disna leuk lik this. An actual nucleus can anerly be accurately descrived uisin quantum mechanics. For example, in a real nucleus, each nucleon is in multiple locations at ance, spread ootthrou the nucleus. In chemistry an pheesics, nucleons are the proton an the neutron, which are the constituents o the atomic nucleus, and are themsels componed o doun an up quarks. The nummer o nucleons defines an isotope's mass nummer (nucleon nummer). The atom is made up o a nucleus surroondit bi electrons. This page wis last eeditit on 25 Apryle 2017, at 03:29.